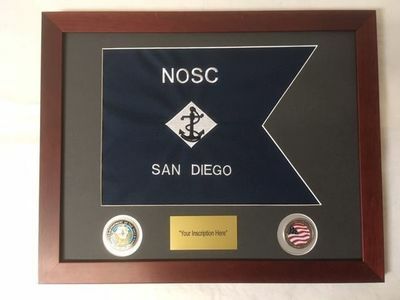 This high quality custom U.S. Navy framed guidon set features a 9" x 12" fully embroidered Navy guidon framed in a 15" x 18" high quality wood frame, acrylic glass to resist breakage, foam core backing, your choice of color matting, and comes ready to hang on your wall. We can also cut holes for one or 2 unit coins (customer provided) for an additional charge. For a more impressive look, we offer double matting to further customize your guidons appearance; we can work in your unit colors. Our optional engraving service includes your choice of black or brass engraving plate with Gold or black letters and includes the first 100 characters. Each additional letter will be charged .20 cents. Please provide your desired engraving information and the guidon letters/numbers placement in the "Comments" section upon checkout. Coins/Devices are provided by the customer. You can either mail them to us or mount them yourself upon receipt of the frame kit. Our Certified Master Framer uses only the best materials for the most impressive look. Please allow 2-3 weeks for completion on this custom item. This does Not include the shipping transit time. NOTE- When the RUSH option is selected, orders will ship within 10 days.